A preview of the web-based map built by faculty and students in IESA shows available business spaces in downtown Gainesville. Faculty and students in the Lewis F. Rogers Institute for Environmental & Spatial Analysis (IESA) at the University of North Georgia (UNG) have created a web-based map that enables the city of Gainesville to promote downtown business space and support the community’s economic development efforts. "When we showed the final product to the city council they were very impressed," said Regina Mansfield, manager of Main Street Gainesville. "This map is an invaluable tool as it helps us visually communicate with and market to prospective downtown business owners, which is very important to economic development." Main Street Gainesville, an organization funded by the city's hotel/motel taxes, promotes the downtown area via marketing, advertising, and business recruitment and retention. Three UNG faculty and two students collaborated with Main Street Gainesville to build the map using their expertise in geographic information systems (GIS). Mansfield said the map is superior to using spreadsheets and similar tools that municipalities typically rely upon. "Most managers have a downtown map and inventory so that when a potential business is interested in opening, they know what's available, including building specs," Mansfield said. "We wanted something more interactive, and we came up with the idea for a virtual tour. 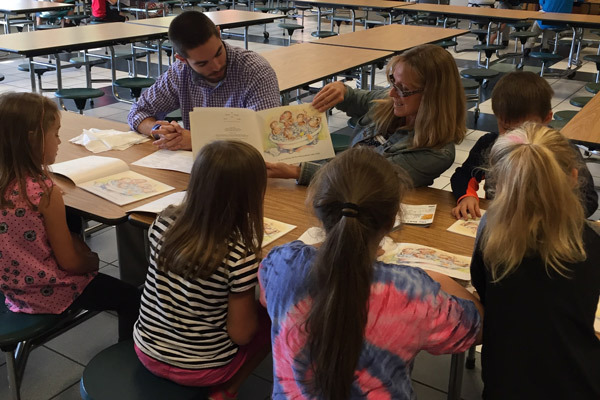 However, we didn't know how to relay this information through an interactive program, so we reached out to UNG personnel for their expertise and GIS knowledge to see if they could help us tie everything together." Dr. J.B. Sharma, professor and assistant head of UNG's Department of Physics, collaborated with Mansfield initially to develop the idea of the map and its features, but students created it. 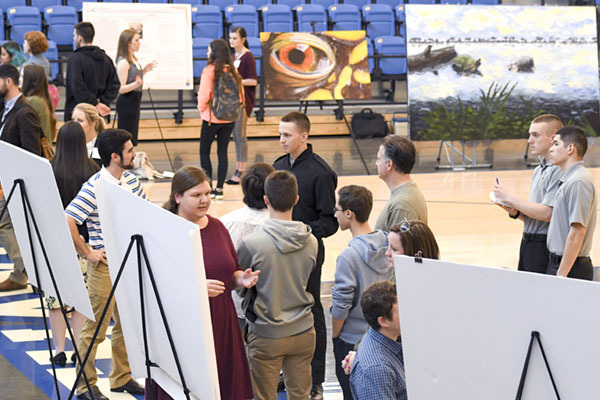 "This project was really a continuation of the knowledge and experiences that I gained through my classes," said Will Cox, one of two UNG students who worked on the project. "There were a few things that were different, such as writing a user guide for someone who doesn't know the software. Also, finding open-source software that could be used in the long term to edit or make a new map was a bit of a challenge." Cox and fellow student Laura Conner also collaborated with IESA faculty members Chris Strother, geospatial technology researcher, and Zac Miller, GIS lecturer. "The students who participated in this project garnered valuable knowledge regarding working with a 'real-world' client with specific goals and expected deliverables," Strother said. "We are hopeful that this will lead to future projects involving IESA students and the city." Mansfield said she now can send the map to interested business owners so they can see a vacant space and click on it to see the building and surrounding area. "People are visual, so for them to be able to see the space is invaluable," Mansfield said. "We could never have done this without the help of the UNG instructors and students — their help has made this aspect of our job so much simpler." Main Street Gainesville was assisted on their end by UNG graduate Jeremy Rylee, who is now GIS manager for Gainesville Public Utilities. The Gainesville City Council plans to recognize the partnership between IESA and Main Street Gainesville at a Feb. 17 meeting with a proclamation designating the day as "UNG/Gainesville Day." In another upcoming partnership, IESA and Chattahoochee Riverkeeper are sponsoring free showings of the award-winning documentary "Who Owns Water," on Feb. 11 at noon and 7 p.m. on UNG's Gainesville Campus. In the film, brothers David and Michael Hanson paddle the Chattahoochee, Flint and Apalachicola rivers to the Gulf of Mexico. After the film, the Hanson brothers along with Jason Ulseth, riverkeeper, and Duncan Hughes, headwaters outreach director, will discuss the movie and answer questions.